History teaches us that problems arise when the White House is forced into abstention; an important point missed in the last presidential face off. During last week’s town hall style presidential debate, a questioner asked Mitt Romney how he would differentiate himself from President George W. Bush. Romney answered by saying that “President Bush and I are different people and these are different times.” He went on to say he’d be better on energy, trade, deficits and small business concerns. President Obama returned by pointing out that Bush never proposed turning Medicare into a voucher system, nor did he call for self-deportation of illegal immigrants or the elimination of funding for Planned Parenthood as Romney has. 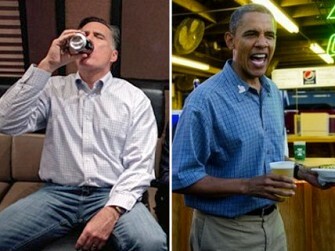 Obama clearly missed the mark in his retort when he did not link Romney to George Bush’s abstinence from alcohol. Alcohol has been linked to some of the most successful presidencies including all of this nation’s founding fathers. Abstinence on the other hand has been tied to some of the most disastrous presidencies on record. In addition to George W. Bush one of the nation’s worst presidents of the modern era, the abstainers include Jimmy Carter, William Howard Taft, William Henry Harrison and Millard Fillmore. George Bush gave us two unjustified wars and the worst recession in a hundred years. Carter presided over crippling high interest rates and the Iran Hostage Crisis. Taft failed to obtain critical international agreements, and turned a blind eye toward racial injustice. William Henry Harrison spent his entire 30-day presidency in bed with a cold which ultimately killed him. Fillmore, was a racist who enacted the Fugitive Slave Act of 1853 which required free states to return slaves to their owners, making their failure to do so a federal crime. He also despised Irish Catholic immigrants. So much for the abstainers. Former Governor Romney doesn’t appear to be faring much better. In the only state he ever held public office, Massachusetts; poll numbers show that Obama leads Romney by almost thirty points. The vast majority of Massachusetts’ residents are non-abstainers. Gee, Mitt must have done a really good job there!